Maker: J. F. Hartz Co. The management of pain was, and still is, an essential part of medical practice. Until the 1840s, Western medicine relied on substances such as alcohol and opium to deaden the senses. The introduction of nitrous oxide (laughing gas), ether and chloroform by the mid-nineteenth century enabled surgeons to safely and effectively reduce pain for longer periods of time. As a result, innovative and increasingly complex surgeries could take place. In North America, ether was first publically administered by Dr. William T. G. Morton (a Boston physician) in 1846. Knowledge of this highly effective anaesthetic spread quickly, making its way to what is now Canada via St. John, New Brunswick where it was adopted by British physicians. 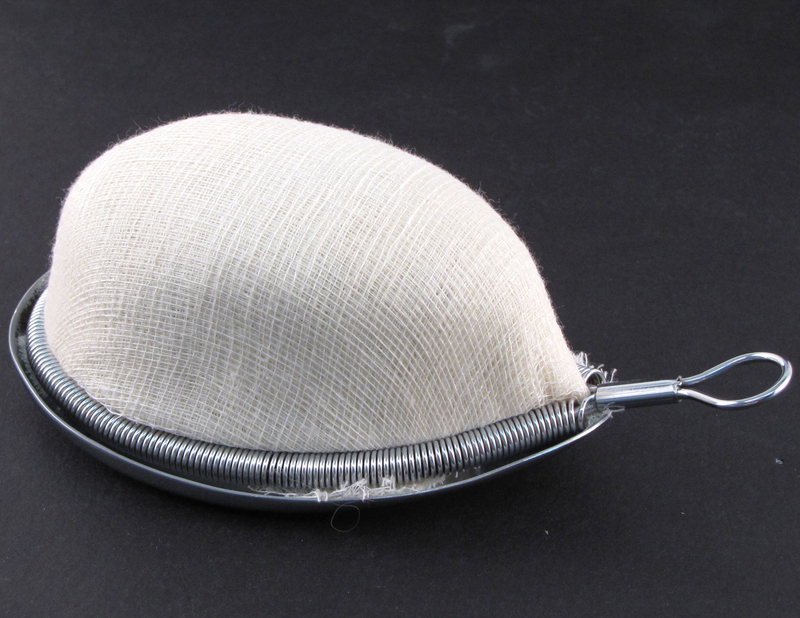 The anaesthetic mask pictured here, designed by Dr. Sydney Yankauer (1872-1932) – an American laryngologist and prolific inventor of medical equipment – became a standard medical tool after it was introduced around 1904. Its chrome-plated wire frame supports a tear-shaped mesh form. Gauze was draped over the frame and held in place using a spring. Ether would have been dropped onto the gauze by a trained health care provider in order to achieve the desired level of anaesthesia. In the early twentieth century, before anesthesiology became a specialty, interns and nurses often administered anaesthetics due to the limited availability of physicians in some areas and to allow doctors to focus on the surgical procedure they were performing. 1. American Association of Anesthesiologists. “Masks & Inhalers: Yankauer Masks.” The Wood Library-Museum of Anesthesiology Online. http://woodlibrarymuseum.org/museum/item/60/yankauer-masks. 2. Duffin, Jacalyn. History of Medicine: A Scandalously Short Introduction. Toronto: University of Toronto Press, 1999. 3. Dunlop, Jennifer, Geertje Boschma and Rosella Jefferson. “Nursing and Anaesthesia: Historical Developments in Canada.” Canadian Operating Room Nursing Journal 27 no. 2 (2009), 16-20. 4. McMaster University Faculty of Health Sciences, The History of the Department of Anesthesia Historical Timeline – Manuscript, McMaster University Online http://fhs.mcmaster.ca/anaesthesia/history/pdf/timeline.pdf. 5. Meals, Clifton G. and Roy A Meals. “A History of Surgery in the Instrument Tray: Eponymous Tools Used in Hand Surgery,” The Journal of Hand Surgery 32A no. 7 (2007), 942-953. 6. Shepherd, David A. E. and Kim E. Turner. Preserving the Heritage of Canadian Anesthesiology: A Panorama of People, Ideas, Techniques and Events. Toronto: Canadian Anesthesiologists’ Society, 2004.